. 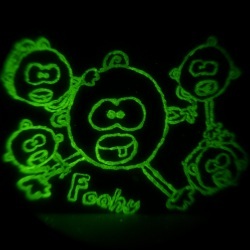 : Optics & Photonics Focus :: Glowing, Enchanted Materials :. Ancient manuscripts offer a fascinating glimpse into times long gone. Alas, these cultural treasures fade over time. A combination of optical techniques and numerical studies may soon aid in their preservation and restoration. Never underestimate the magic of a glowing object. From the flare of a fire deep in the darkness of a cave, to the flashy neon illuminations in Times Square, luminescent materials have fascinated mankind for centuries. This enchantment continues with novel materials that can go on glowing for days without receiving continuous power from an energy source. Shedding light in the dark. Zhengwei Pan and Feng Liu stand in a darkened room, using nothing but their recently invented ceramic discs that emit infrared light as a source of illumination. The image was taken using a digital camera with a night vision monocular. Their phosphorescent material was also mixed into the paint that was used to create the UGA logo behind them. There is no other source of illumination in the room; without the aid of a night vision device, the image would be completely dark. Credit: Zhengwei Pan/University of Georgia, USA. In the seventeenth century in Monte Paderno, just outside Bologna, an Italian cobbler named Vincenzo Casciarolo discovered a stone that glowed all night, long after being exposed to sunlight: what a fascinating luminescence phenomenon! And what a long way we have come since then! Modern luminescent materials emitting persistent luminescence in the three primary colors (red, green, and blue) are routinely used in many applications, including night vision goggles, LEDs, or emergency lighting. 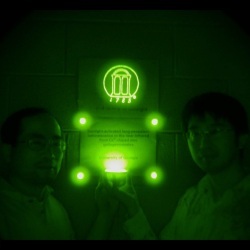 Now researchers from the University of Georgia in the USA, led by Zhengwei Pan, present to the world a new material that can emit infrared light for over 15 days following only a few seconds of sunlight activation. This material has the potential to revolutionize current technologies that utilize infrared luminescence for night vision, and much more. Luminescent materials can store energy and emit it over time in the form of light. Normally, the electrons in these materials are in their ground state, the state with the lowest possible energy. When excited by an external source, such as light, heat, or electricity, these electrons can gain extra energy, moving into what is known as an excited state. Luminescent materials eventually release this energy in the form of light. Luminescence has a lot of fascinating applications: in nature, animals such as fireflies or glow worms use it to scare away predators and in selecting a mate; in our everyday lives, we too have learned how to use it in different forms, ranging from fluorescent lamps and LEDs, to lasers and display boards. Unfortunately, luminescence is normally short lived and needs constant external excitation. Or does it? What if there were a material that could luminesce persistently and shed light for days after a short initial excitation? The answer comes from Monte Paderno: Casciarolo´s stone is the first recorded natural example of persistent luminescence. Zhengwei Pan explains that "persistent luminescence is a kind of light emission phenomenon, which generally occurs in some special luminescent substances called persistent phosphors." He continues by pointing out that "unlike what happens in conventional phosphors, where the light emissions only take place during the excitation period, the persistent phosphors exhibit a very slow decay of light emission, which typically lasts, at room temperature, several hours after excitation by ultraviolet light or visible light." Although the physical picture of this process is still not clearly understood, it is believed that these materials possess traps which can store some energy and release it gradually to the different parts of the materials where emission occurs. Rare-earth doped compounds are generally used to obtain persistent luminescence with visible colors. For example, compounds containing europium are used in some security features of the Euro banknotes. Super glow painting. Five monkeys were drawn using NIR persistent paint that was made by mixing NIR persistent powder into a water-based indoor wall paint. The picture was initially drawn by Grace Pan and traced by Zhengwei Pan. The image was taken using a digital camera with a night vision monocular in a dark room. Credit: Zhengwei Pan and Feng Liu/University of Georgia, USA. The work of Zhengwei Pan and colleagues now presents a new material that can emit persistent infrared luminescence after absorbing visible and ultraviolet sunlight. Despite the success in achieving, and even commercially using persistent blue, green, and red luminescence, infrared luminescence was difficult to obtain due to the unavailability of suitable materials that could emit such light. Zhengwei Pan’s team chose trivalent chromium (Cr3+) as the emitter, because it is known to give a strong red and infrared emission; for example, trivalent chromium is responsible for the red color of ruby. The researchers then built a chemical structure with a matrix of zinc and gallogermanate, a compound containing gallium and germanium, to host the trivalent chromium. Thanks to the chromium, once the excitation energy has been trapped, this structure releases it as infrared light in a process that can continue for hours, or even days. These new materials capable of emitting persistent infrared luminescence have immediate and potential applications, for example, as sunlight absorbers in solar cells, and as optical probes for in vivo tissue imaging. With their long lasting luminescence, they can also be of extreme use in defense — in case of war, for instance, when infrared light is used to visualize the presence of an enemy in the dark. And, hopefully, one day we will see our cities illuminated with lights powered by sunlight, thanks to persistent luminescence. The search for efficient materials that possess persistent luminescence has led to several new artificial composites with interesting light emitting properties. Zhengwei Pan and coworkers’ result, in this regard, has been a breakthrough, for their materials can luminesce for days after the excitation source has been cut off. E. Newton Harvey, A History of Luminescence: From the Earliest Times until 1900 ( Amer. Phil. Soc., Philadelphia, 1957). J. Hölsä, Persistent luminescence beats the afterglow: 400 years of persistent luminescence, Electrochem. Soc. Interf. 18, 42-45 (2009). SC is currently working as a postdoctoral researcher at the university of Minnesota, USA. Zhengwei Pan, Yi-Ying Lu & Feng Liu, Sunlight-activated long-persistent luminescence in the near-infrared from Cr3+-doped zinc gallogermanates, Nature Materials (2012) 11, 58-63 (link).